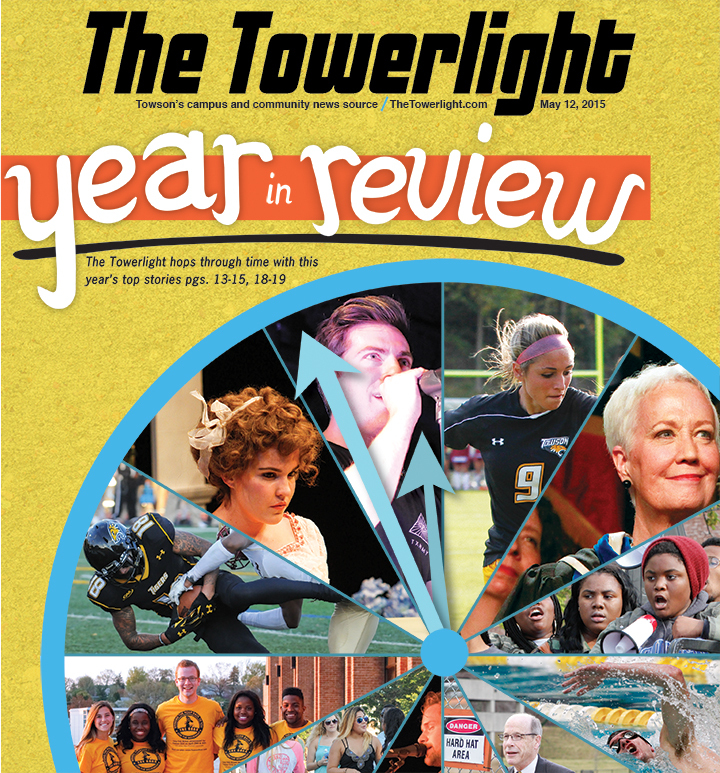 The Towerlight hops through time with this year’s top news, arts & life and sports stories. Maravene Loeschke resigned as university president in December after a semester-long leave of absence. Loeschke resigned her position because of her health. The previous April, Loeschke announced that she was battling cancer. Until her resignation announcement, the university said that Loeschke was planning to return after one semester. In her absence, Provost Timothy Chandler stepped in to serve as acting president. After Loeschke announced her resignation, his role changed to interim president – a role that he is still in. In April, the University System of Maryland, of which Towson is a part, announced the formation of a presidential search committee. According to a statement released by the USM, the search is expected to be completed within six months. Most members of the search committee are affiliated with Towson University in some way. At a recent university town hall-style meeting, Chandler announced that he would be entering his name for consideration to continue to serve as president. Former Towson professor Barry Freundel was arrested in October 2014 on voyeurism charges. Freundel had also been the rabbi of the Kesher Israel Congregation in Washington, D.C., a longstanding and prominent synagogue. For a time Freundel was suspended, with pay, from Towson University, per University System of Maryland policy. Freundel resigned in February, and the resignation took effect 30 days later in March. From the time he was put on leave to the time his resignation took effect, Freundel collected over $30,000 from payroll. Towson University was conducting a Title XI investigation related to Freundel, but the investigation was closed with Freundel’s resignation. In February, Fruendel pleaded guilty to 52 counts of voyeurism. His sentencing hearing is set for May 15. Campus police located Cole using GPS on his phone. He was arrested and charged with one count of threat of massive violence and one count of disturbing the operations of a school. His trial is scheduled for May 12 in the Towson District Court. Reportedly, Cole made the posts around the time he learned he was not performing well in a jazz class and was worried his parents might pull him out of school if his GPA fell. In its April 21 cover story, The Towerlight reported on Cole’s trial and the supposed anonymity of apps like Yik Yak. After the death of Freddie Gray in police custody, Baltimore erupted into protests and, subsequently, some riots. For a time, there were rumors that riots or related events would spread to campus or to the Towson community. On one night a threat was called into Cook Library that resulted in an evacuation. There was no incident, however, and no arrests were made. Eventually, two Towson students, Korey Johnson and John Gillespie, led a rally on Towson’s campus that began at Freedom Square and then led a crowd of college students to Penn Station in Baltimore. The march, led by Johnson and Gillespie, drew nearly 1,000 students, families and members of the Baltimore community. The group marched from Penn Station to Baltimore City Hall with no reported arrests or incidents. 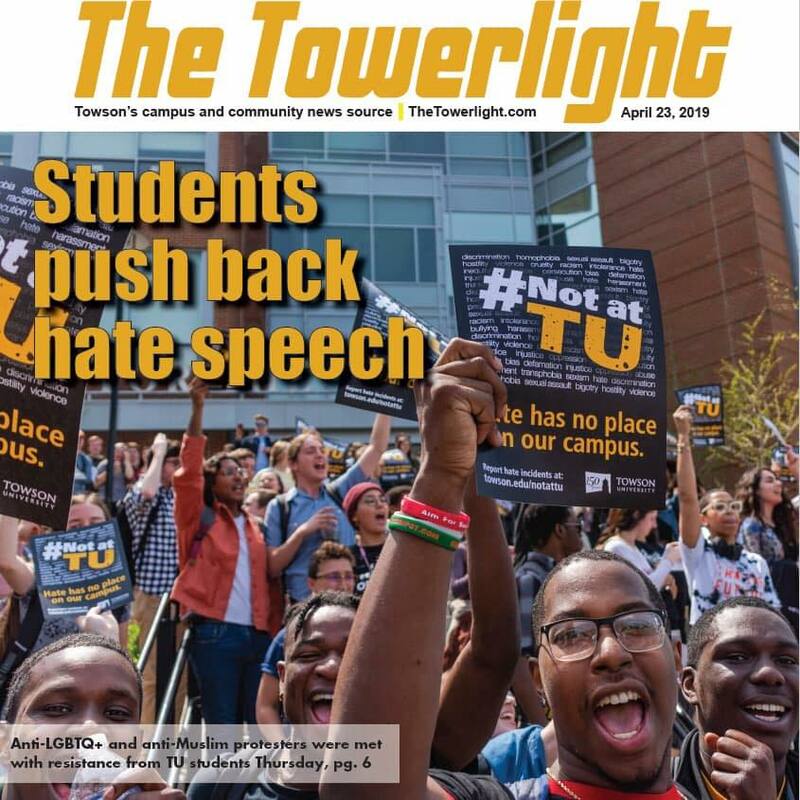 Towson University also hosted a number of “teach-ins” and drop-in lunch sessions where students could meet with each other, faculty and administrators to discuss the events that had been happening in Baltimore and the larger issues underlying them. This year’s SGA election saw competition between two executive board tickets, Ohana and The Roar. 33 students ran for the 18 available seats in the SGA Senate and six students campaigned for the five Judicial Board positions. 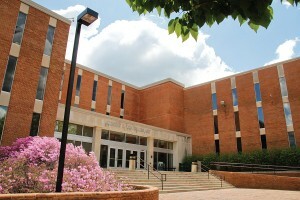 The Ohana ticket campaigned on ideas of reevaluating the plus and minus system, bringing Greek Housing to campus, raising the value of a meal to $6.00, expanding the Senate to 29 seats, finding funding for TUPD and SAFE at SGA-affiliated events and optimizing meeting space for student groups. The Roar Movement focused on greater oversight on SGA internal spending, reconsideration of the Tiger Stripes program, creation of a President’s Council for student groups, establishing a “meal bank” and implementing SGA diversity training. The election drew votes from 3,247 undergraduate students, more than twice the turnout of last year’s uncontested election, and the Roar ticket found widespread success. All 12 of the senatorial candidates who campaigned with the movement, listed on the Roar’s website, won their desired seats. All but one of the Roar’s Judicial Board candidates won their positions. Kurt Anderson, who acted as SGA’s director of communications this year, was elected president over 2014-2015 Chief of Staff Gayon Sampson by a margin of 444 votes. Vice President Taylor James earned 1,867 votes, the most out of any executive board candidate.Treasurer Rebecca Ellison won her position with 1,765 votes, and Vanessa Agbar took Attorney General with 1,771. Inaugurations took place May 8 at noon. To complete the Executive Board, Jamal Washington is expected to serve as Chief of Staff. He will need to be confirmed by the Senate at an upcoming SGA session. Towson adjunct professor William Toohey died Thursday, March 26, following a short battle with intravascular lymphoma. Toohey, who taught in the mass communication and communication department, was 69 years old. In addition to his work with Towson University, Toohey’s career also included acting as press secretary for U.S. Senators Barbara Mikulski and Paul Sarbanes, an ABC and NBC radio reporter and spokesman for Baltimore County Police. In September, following a few crowded and raucous tailgates, members of the university administration announced plans to either entirely eliminate or heavily restrict student tailgating. After several meetings with student leaders, the President’s Council eventually announced that student tailgating would not be banned, but new rules and guidelines would be put in place. Members of the Towson community were worried that a ban on student tailgating would cause student parties and activities to spill out into neighborhoods on game day. Some alumni also expressed concern and frustration with the possibility that tailgating could be banned. Next semester, the tailgating policy will remain unchanged from before. Students will be able to, once again, bring pickup trucks and attend a tailgate without acquiring a permit. According to Teri Hall, associate vice president for campus life, there will be more emphasis on enforcement – not on a change of policy. This academic year’s construction spanned all of campus. 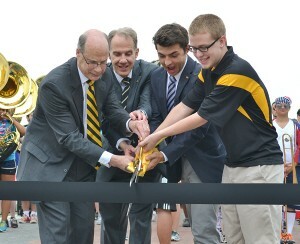 In August, the anticipated West Village Bridge was opened to allow students to safely cross Osler drive. Burdick Field got a facelift when its natural grass, which was often muddy and unusable, was replaced with turf. Following weeks of construction, the field reopened Dec. 1 with a ribbon-cutting ceremony. In the Towson Center, vacant racquetball courts were replaced with new golf team practice spaces. The two-room facility now includes special areas for full-swing practice and putting, complete with four built-in holes, two hitting bays and FlightScope that captures information about the golfer’s swing, the ball’s expected flight path and more. The Tiger Softball Complex got a more costly upgrade. Its enhancements cost the state $2 million. According to a prior Towerlight story, new amenities include “sunken dugouts with restrooms, improved spectator seating, a press box, a concession stand with restrooms and a new scoreboard,” as well as Astroturf for the batting cages and bullpens, and a new sound system. Burdick Hall will also be enhanced in the coming year. In September, The Towerlight reported that the building will receive an addition worth approximately $34 million. The addition will include new spaces for team-based sports, cardio spaces, an elevated track, varied exercise apparati and fitness studios. In line with phases three and four of the West Village housing project, outlined in the Master Plan, this year the University broke ground on two new residential facilities. Together, the two buildings will add approximately 700 beds to campus and occupy 325,500 gross square feet. Construction on these two facilities is slated to conclude in time for the halls to open in Summer 2016. 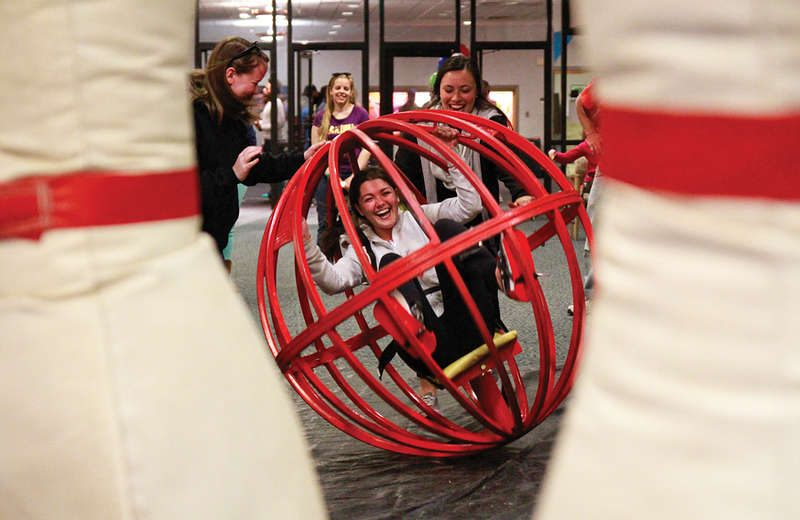 This year’s Tigerfest brought students a weekend full of music, food, games, prizes and fun. Students attended the two-day event to celebrate the coming of spring and the closing of another successful school year. 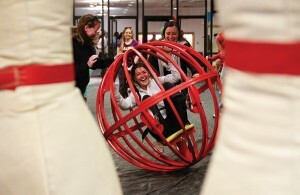 Day One of Tigerfest on Friday, April 24 took place in the University Union. Live music echoed around the campus from artists such as Have Mercy, RDGLDGRN, Dunson, Dale Z and the ZDubs, Hunter Hooligan, HNE and 3 PM on three stages located in Paws, Potomac Patio and Tiger Plaza. After enjoying some musical performances, students enjoyed other free activities like munching on cotton candy and mozzarella sticks, riding mechanical sharks, bouncing around on inflatables, entering raffles and even knocking down pins in a round of human bowling. Day One pumped students up for the big event of Day Two: The Tigerfest concert featuring West-coast rapper G-Eazy and EDM duo Krewella. Students and audience members danced the night away and got to end the 2015 school year with a fun memory. Towson students got down with their country roots and with country music artists Love and Theft and Joel Crouse on March 29. Towson welcomed “Orange is the New Black” actress Jackie Cruz to campus on Feb. 19 to hear about her journey to the small screen, and her advice to those also looking to pursue their dreams. Campus Activities Board invited Cruz to present her lecture The Harmony of Life, where she spoke about overcoming the challenges in life. “Life can be harmony and it can also be a nightmare sometimes, but life is worth living,” Cruz said. While the most common secrets shared were intimacy related, that didn’t stop Warren from sharing that the second most common secret was that people often pee in the shower. Through PostSecret, Warren wanted students to understand the importance of communication and the effect that secrets can not only have on ourselves but, also the people we choose to share them with. Unlike past years, The 2014 Homecoming concert swapped the usual packed Towson Center experience for a more intimate vibe for students in Paws in the University Union. 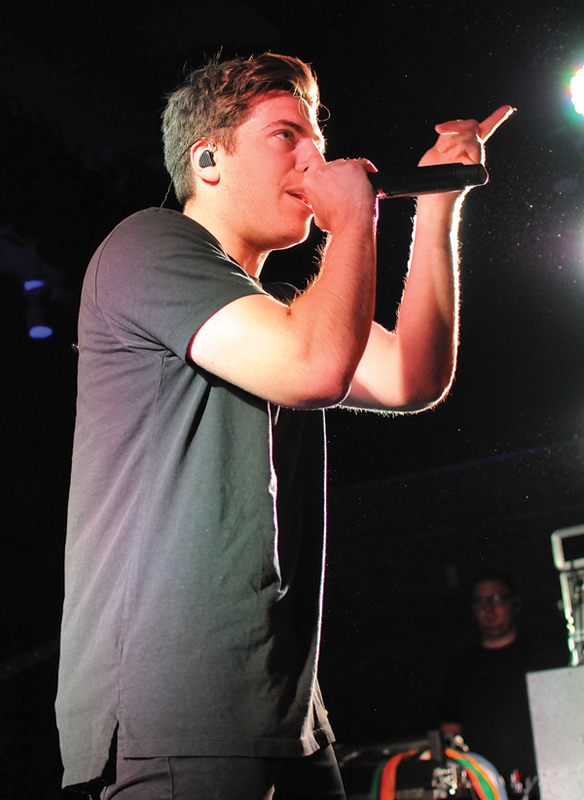 This year, Hoodie Allen headlined the Homecoming concert and brought some frat-rap tunes for students to celebrate the start of a new school year. The concert had a 400 ticket limit, giving eager students the chance to be up close and personal with the rapper. After accidently sending an email that she had written as a joke to her professor, senior Ja-Niece Best woke up the morning of Sept. 4 to discover that her mistake had gone viral. Best, an avid Beyoncé fan, had drafted an email to her professor stating that she would not be attending class in order to celebrate the superstar’s 33rd birthday. She posted a screenshot of the email on Twitter, where it was retweeted by followers, Beyoncé fans and other Towson students, until several hours later when the story showed up on Buzzfeed. 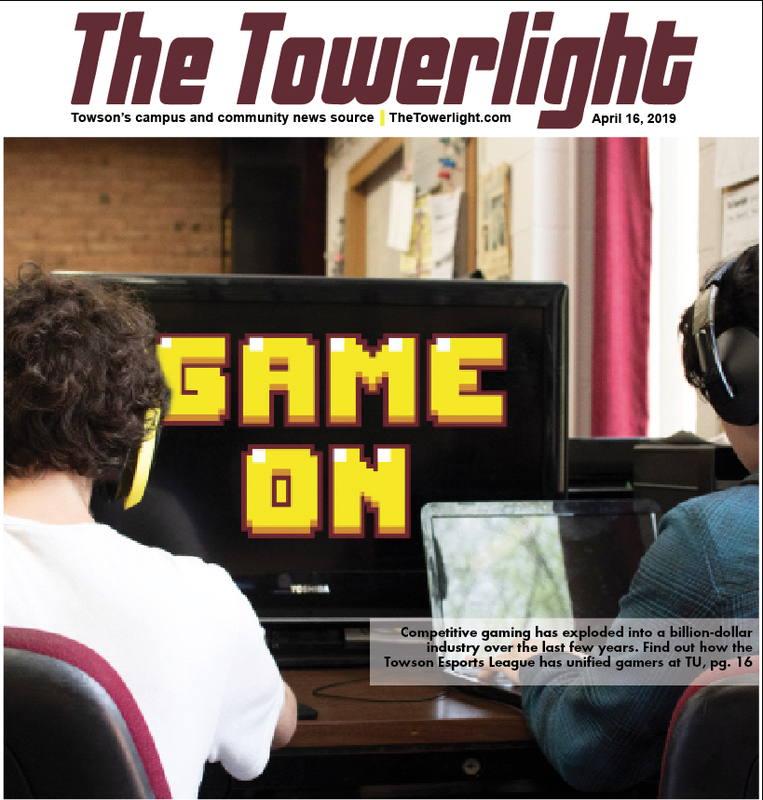 Hundreds of news sources including ET Online began to feature the story and gave both Best and Towson a little bit of fame that week. .
Over the past year, The Towerlight has had the opportunity to write about several theatre productions over at the Center of the Fine Arts. In this section, I will be taking you back through them. October: From October 16-October 25, the CFA’s Mainstage Theater hosted Towson’s production of Oscar Wilde’s play, “The Importance of Being Earnest.” Directed by Steve Satta, the plays follows the story of Jack Worthington, a Victorian man, his false alias, and the craziness that ensues from it. March: For a two-week run from March 4-12, the Mainstage Theater was home to another play; this time it was Towson’s production of Aaron Posner’s play, “Stupid F*cking Bird” Based off of Chekhov’s play, “The Seagull,” “Stupid F*cking Bird” tells the story of an “An aspiring young director rampages against the art created by his mother’s generation. A nubile young actress wrestles with an aging Hollywood star for the affections of a renowned novelist. And everyone discovers just how disappointing low, art, and growing up can be”. April: For the first time this year, the Mainstage Theater hosted a musical production and that musical was “Sweeney Todd: The Demon Barber of Fleet Street.” The musical, directed by Stephen Nunns, is “based on this sort of apocryphal story about a barber in the 1800s who murdered people.” Led by James Ruth and Caitlin Weaver as Sweeney Todd and Mrs. Lovett, the production ran from April 23-May 2. 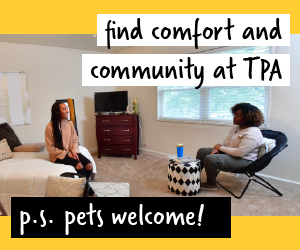 This year, Towson University students finally gained the ability to see a new movie without traveling all the way to White Marsh. The Towson Square development project opened, and with it, a Cinemark movie theater that even offers student discounts. The cinema features dining during the movie, an upstairs restaurant and bar area and a plentiful concession stand including beer and wine. Cinemark was joined by Nando’s Peri-Peri, a fast-casual style restaurant that specializes in its specially flame-grilled Afro-Portuguese chicken. Towson Square, located right uptown, also features a Bonefish Grill and On the Border, a Mexican restaurant. Football – Towson football began its 2014-2015 season with high hopes, coming off an appearance in the 2014 Football Championship Subdivision Championship game that year before. However, after an opening weekend loss at home to Central Connecticut State, Towson traveled to West Virginia with a chance to start 0-2. It wasn’t like the UConn upset of 2013. The Tigers fell to the Mountaineers, 54-0, in front of a large homecoming crowd in Morgantown. Mountaineers quarterback Clint Trickett went 35-for-40 for 348 yards and two touchdowns to lead the way. Towson finished the season 4-8, nine fewer wins that last year. Women’s Ice Hockey – Towson capped off a perfect 15-0 season and won the Delaware Valley Collegiate Hockey Conference Championship for the second consecutive year Sunday, Feb. 15. The Tigers opened their season Sunday, Nov. 2 with a 10-1 win over University of Pennsylvania and never looked back. After its season opening defeat of the Quakers, Towson defeated University of Maryland, Navy, Villanova, Rutgers, North Jersey Phoenix and Loyola. In the playoffs, the Tigers defeated Loyola and Villanova to advance to the championship game against Navy. In a close game Towson prevailed over the Midshipmen 3-2 with the game-winning goal coming off of the stick of Emily Potere. Next season, Towson will look to win its third consecutive DVHCH Championship. 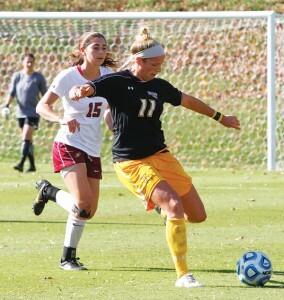 Women’s Soccer – Towson played in its first Colonial Athletic Association tournament in school history Sunday, Nov. 2 in Hofstra, New York. Despite early season troubles in which the Tigers went 3-8-3, the team was able to win three out of its last five games and make the CAA tournament with a 6-9-4 record. Down the stretch, Towson beat CAA opponents Delaware, Elon and William & Mary to qualify for the CAA tournament. In the CAA tournament, the Tigers fell to Hofstra in the quarter-finals 3-0. Towson fell behind early as the Pride scored just two minutes and 14 seconds into the match to take a 1-0 lead. The Pride would add two more goals later in the game to seal the Tigers fate. Next year, Towson will look to make the CAA tournament for the second straight season. Cheer and Dance – The Towson University cheerleading team won its second National Cheerleading Association Collegiate National Championship in the All Girl Division 1 Category while the dance team won its 17th consecutive National Championship Friday, April 10. After competing in preliminaries, the Tigers cheerleading team was in placed first and advanced to the finals with a score of 94.25. In the finals, Towson placed first with a score of 92.38 to edge out Sam Houston State University (92.33) and Stephen F. Austin State University (90.45). Next year, the Towson University cheerleading team will look to win its third NCACN championship in the All Girl Division 1 Category while the dance team will look to win its 18th consecutive National Championship. Gymnastics – Towson capped off its season finishing third in the East Atlantic Gymnastics League Championships (195.225) and 10-13 overall Sunday, April 22. Despite losing five out of their last 10 meets, the Tigers earned high honors in the 2014-15 season. Head Coach Vicki Chliszczyk won League Head Coach of the Year after leading the Tigers to their highest EAGL postseason finish since 2001 while Assistant Coach Becky Schaller won Co-Assistant Coach of the Year. Freshman Tyra McKellar was named the team’s MVP and First All-Tournament Team in the bar and floor events. McKellar was also names Second All-Tournament Team in the beam event. A total of 10 other athletes were named Fist and Second All-Tournament Team in their respective events. Towson’s schedule for next year is still TBD. 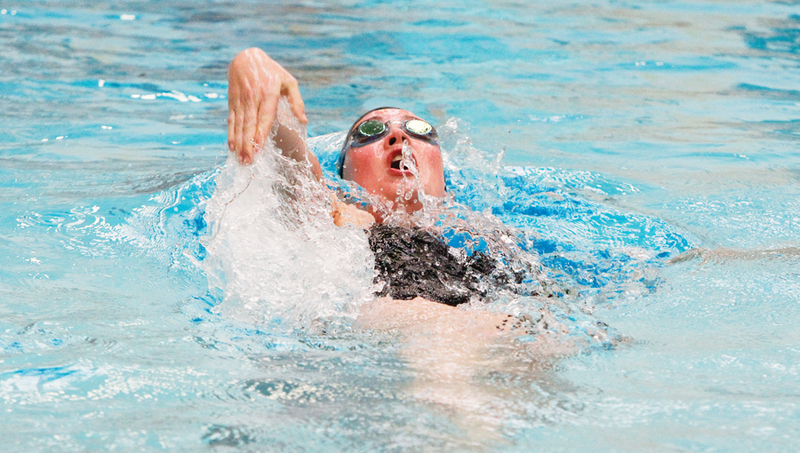 Women’s Swimming and Diving – Towson capped off its seasoning finishing first in the Colonial Athletic Association tournament and a perfect 10-0 overall Sunday, March 21. In their regular season meets, the Tigers knocked off William and Mary, Georgetown, Old Dominion, College of Charleston, Northeastern, George Mason, George Washington, McDaniel, Delaware and Johns Hopkins. In the CAA Tournament, Towson finished first in the four-day meet with a total of 720 points. After being crowned CAA Champions, the Tigers competed in the NCAA Swimming and Diving Championships. On Day One of the NCAA Swimming and Diving Championships, junior Jenna Van Camp placed 28th in the 100-meter breaststroke preliminaries with a time of 1:00.53, while sophomore Macey Arnold placed 53rd in the 200-yard free style with a time of 1:48.26. On Day Two, Arnold placed 22nd in the 1650-yard breaststroke preliminaries with a time of 16:12.69 while Van Camp placed 25th in the 200-yard breaststroke preliminaries with a time of 2:10.78. Former Miami quarterback Kevin Olsen didn’t stay with Towson for long. He announced he was transferring to Towson in December and he joined the team for spring practice this year. However, Olsen came with a troubled past, a DUI arrest that eventually led to his dismissal from Miami. It didn’t take long for Olsen to be looking for his third school. Olsen left the school after being kicked off the team for a violation of team rules in March. He never played a snap for the Tigers. The 2014 draft was a busy one for the Cleveland Browns. They selected controversial quarterback Johnny Manziel with the No. 22 overall pick on the first day of the draft. Late on the second day, in Round 3, they traded up to select Towson’s own Terrance West to join Johnny Football in their offense. While Manziel’s season hardly got off the ground, West had a solid rookie campaign. He split time with fellow rookie Isaiah Crowell, who went undrafted in 2014 due to off-the-field issues at Georgia (he eventually transferred and finished his career at Alabama State), and Ben Tate for the first part of the season. West and Crowell’s strong start of the season allowed the Browns to eventually release Tate. For the remainder of the season, West and Crowell shared carries. Cleveland’s run game fell off in the middle of the season when starting center Alex Mack broke his leg, but with the poor performance of Manziel and Brian Hoyer under center, the running game was the only offense the Browns had to lean on. West had one 100-yard game, in Week 1 against the Pittsburgh Steelers, and had two 94-yard games, including one in the final game of the season against his hometown Ravens in Baltimore. 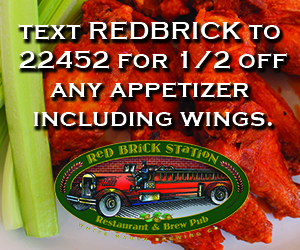 He finished the season with 673 yards (3.9 yards per carry) and four touchdowns. After playing with the Denver Nuggets and Miami Heat during the two leagues of NBA summer ball, Jerrelle Benimon, the 2013 Colonial Athletic Association Player of the Year was signed to the NBA D-League to play with the Idaho Stampede. Benimon appeared in 44 games at small forward and power forward for the Stampede and averaged a double-double (19.8 points and 11 rebounds) including shooting an astounding 61.4 percent from the floor. He eventually signed a 10-day contract with the Utah Jazz on March 6, but only appeared in two games and didn’t score a single point, but did have a combined three rebounds. The Jazz did not offer him a second 10-day contract, and he returned to Idaho immediately. Benimon still had a solid season in the D-League, finishing the year as a member of the All-NBA D-League First Team and as a D-League All-Star. At the beginning of the 2015 spring sports season, Towson’s softball and men’s and women’s golf teams were able to start strong at two new on-campus facilities. The softball stadium was renovated using the $2 million granted from the State in the Spring of 2013. The upgrade was one that had been in the works since 2002 when the field’s conditions were considered to be a Title IX inequity. The new stadium now features new sunken dugouts with restrooms, improved spectator seating, a press box, a concession stand with restrooms, a state-of-the-art sound system and a new scoreboard. The batting cages and bullpens were also given Astroturf. The new indoor golf facility, which replaces the old racquetball courts behind the Towson Center, was constructed using $30,000 in donations. Men’s Golf Head Coach Brian Yaniger began the fundraising process years ago, and according to him construction began on the project shortly after the Space Committee approved the plan in early 2014. The new facility features two rooms: one used for full-swing practice and the other is for putting practice with four built-in holes that emulate a true breaking green. The Baltimore Orioles won the American League East in September and carried the excitement into October. They took on the Detroit Tigers in the AL Division Series and, with the help of the iconic Delmon Young three-run double, swept the Tigers in three games. The No. 2 seed Orioles advanced to the AL Championship Series to meet the surprise Kansas City Royals. The Royals magical run, though, continued into the series. This time, it was the Orioles that suffered the sweep in four games. It was the farthest the Orioles had gone in the postseason since 1997 and the second time in three years they made the playoffs. 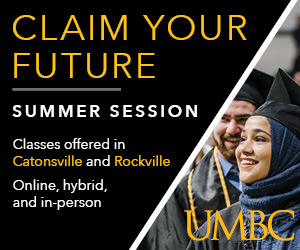 America fell in love with Kacy Catanzaro in summer 2014, but Towson had fallen in love long before that. Catanzaro, the former Towson gymnast and 2012 alum, competed on the show “American Ninja Warrior,” and became the first woman to complete the qualifying course in Venice Beach, California. From there, Catanzaro became a hit. She continued through qualifying and made it to the show’s final stage, Mount Midoryama. She couldn’t conquer the final stage, but said she’ll be back this summer to try again. 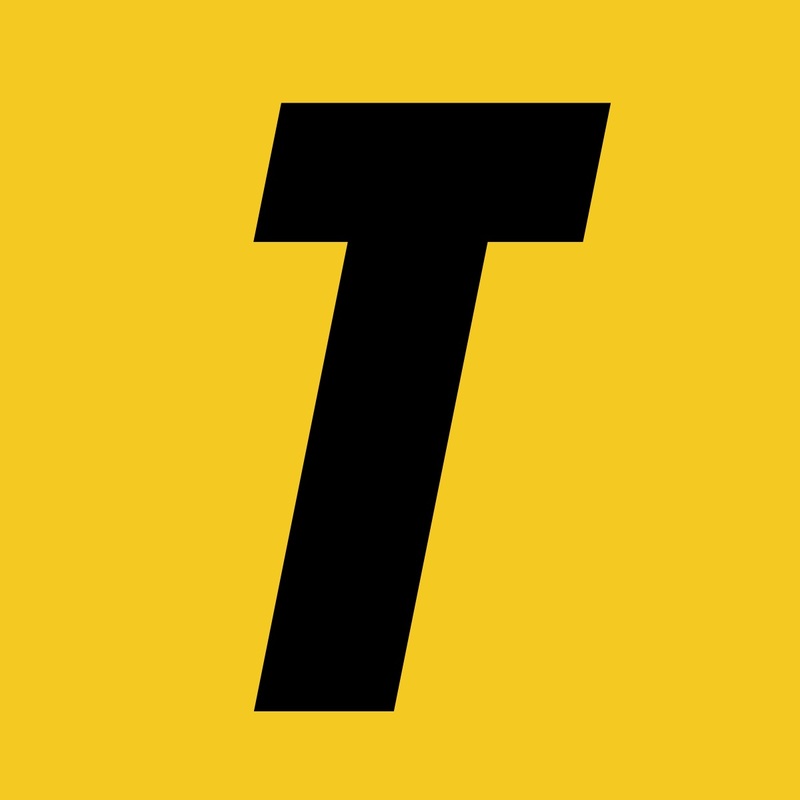 – Compiled by Towerlight Editors and staff.